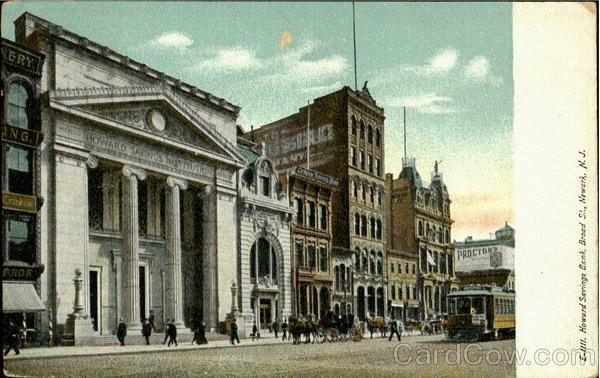 The above pictures (thanks to Google) are of The Howard Savings Institution bank in Newark, New Jersey. I’m guessing that these pictures are from the early 1900’s ! 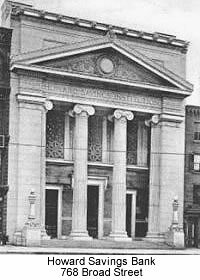 The Howard Savings Institution received its charter in 1857 and met its demise in Oct 1992. (That’s a whole other post). I worked at the Howard in the mortgage department from Feb 1960 until Feb 1964. Last weekend I was in Newark and I took the following pictures of what this once beautiful and stately bank building looks like now… it’s very sad. The columns are gone and the Howard Savings Institution is gone from the front of the building but look closely along the top… the lion heads of different colors remain ! The next time I go back to Newark I think I’ll go inside the store that’s there now and see if any remnants of the inside of the bank remain ! I think not though. Wandering a little further down Broad Street we come to the National Newark & Essex bank building which is where my mother worked. 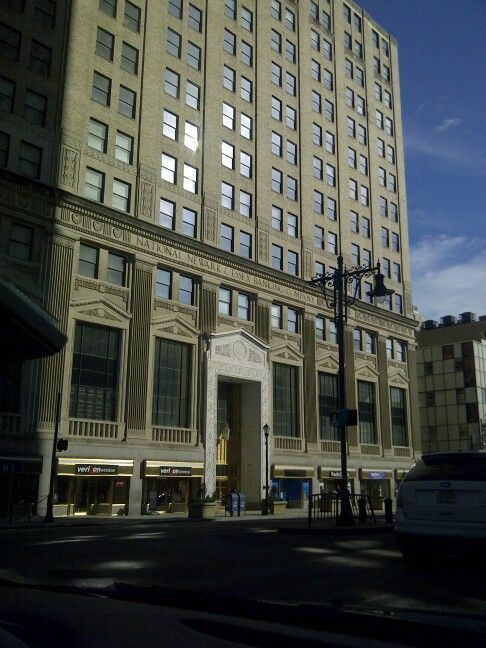 The following information was taken from an article on Google – “The beginning of the rebirth of the 744 Building, now referred to as the “National Newark Building” began in November 1997 when the Helmsley estate sold the 744 Broad Street building to Cogswell Realty Group, which announced that it would restore and reconstitute the building to its former glory. The article that I cited before also mentioned..”Among the new improvements were 1,500 new openable thermal windows, 15 high speed elevators, removal of the escalators, and the lobby given a complete facelift with restored 25 feet high plaster ceilings and grand chandeliers”. I remember those chandeliers from my childhood when I used to visit the bank with my mother. I am hoping during my next trip to Newark that I can go inside the bank which was closed the Saturday I was there… and see if I can step back in time. Categories: architecture, cities, Martha's Vineyard, New Jersey, Newark, NJ, Photographs, photoshop | Permalink. Thank you for the nice words. I will go back but not until the weather is better. I really want to see the inside of these 2 buildings. I know I’ll be pleased with the Nat’l Newark building but will be distressed at what has become of the Howard where I worked. Lots of memories in that building.